Great meet on Saturday! Girls took 2nd of 16 and were sectional runners up! Boys placed 5th of 14, up four sports from just a year ago! Very impressed with the 71 additions to season-best times! Results and our schedule for the week are linked below. There will be a booster meeting tomorrow 2/11 at 6:30pm in the HS Library. If you are interested in helping support our swimmers we would love to see you there! Fantastic work at Champs this past weekend! So proud of the team effort! 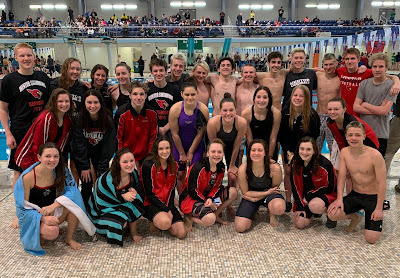 Cardinal swimmers achieved 45 season best times! 6 swimmers and 3 relays reached the podium with top 8 finishes, this out of 400 swimmers in the meet! Results and practice schedule for the week included below. 1.) It is critically important to be at practice each day during taper. Our goal is a controlled drop of both yardage and intensity by day. One missed day can dramatically throw off the results. Try to eat healthy and avoid junk food. Try to get as much rest as possible including a good night of sleep. Last year we saw 53 of 56 swims at sectionals be season and/or lifetime bests. Remember that taper works as well as what you put into it! Sat 2/9 AM – Meet against Sectionals at Spire. Bus TBA. Start 11:35am. Great way to end the season! Both teams finished with wins over South and Euclid on Saturday! Girls season record ends at 11-4 and boys 10-5! Champs will be held Saturday for swimmers that have already been tapering. Swimmers in Sectionals (Sat Feb 9th) have a full week of practice. Lineups with exact events will be posted during the week. Results from this past week are linked below. 1.) It is critically important to be at practice each day during taper. Our goal is a controlled drop of both yardage and intensity by day. One missed day can dramatically throw off the results. Try to eat healthy and avoid a lot of junk food. Try to get as much rest as possible including a good night of sleep. Last year we saw 53 of 56 swims at sectionals be season and/or lifetime bests. Remember that taper works as well as what you put into it! 2.) This will be the last week of any morning/makeup practices. Nobody should be doing doubles at this point because of the taper. 3.) We are in need of a few parent volunteers to sell 50/50 tickets at the home basketball game on Saturday night. Please email kathiec@me.com if you would like to help out! Thank you! Great job at the meet on Friday night! The girls defeated Medina and Elyria to improve to 9-1 and the boys defeated Elyria to reach 6-4! We will post the full results as soon as we receive them from Medina. This week we have two meets including our senior night on Saturday! 1.) We are in need of a few timers for our home meet Saturday against South. If interested, please place your name on the Google Doc linked here. Thank you! 2.) The meet on Friday hosted by Chardon has been changed from Perry to Spire. The meet will still begin at 6:30pm. 3.) For practice absences, please send us a quick email with date and reason (doc appointment, family emergency, sick, sport, etc) so that we can update attendance. Remember that missed practices should be made up and you have two options to meet your attendance requirement for each day! A giant thank you to those of you that have been on track with this! Mon 1/21 AM – No morning practice due to the weather. Fri 1/25 PM – Meet at Spire against Brunswick and Chardon. Bus 4:30pm. Start 6:30pm. Sat 1/26 AM – Meet at Spire against South. Bus 11:30am. Start 1:30pm. Excellent swimming this past weekend! Mentor girls ended up in first place of fourteen schools and boys first place of thirteen schools at the Perry Invitational. Mentor swimmers combined for 48 season-best times at the meet. Results are included below. We are still waiting to receive results from the Mustang Invitational held in Strongsville last Wednesday. 1.) We are in need of a few timers for our home meet Saturday against Strongsville and Euclid. If interested, please place your name on the Google Doc linked here. Thank you! 2.) Lineups for the meets will be posted during the week. Our intention (as always) is to enter everyone in the meet. The school hosting decides what events/how many heats they will run. I expect to get everyone in the meet Friday but it will ultimately depend on what Medina allows. All of our swimmers will be entered in our home meet on Saturday. 4.) The MLK Sprint Invitational hosted by Chardon on Mon 1/21 has been canceled due to low interest from area teams. We will instead have practice at our normal times. Fri 1/18 PM – Meet at Medina against Medina and Elyria. Bus 3:45pm. Start 6:00pm. Sat 1/19 AM – Meet at Spire against Strongsville and Euclid. Bus 8:45am. Start 10:30am. Phenomenal job at our meets this past weekend! We saw 84 season best times set between the meets Friday and Saturday. Girls defeated both Euclid and Wickliffe on Friday! Girls took 3rd/8 and boys 5th/8 at the Greater Cleveland Conference meet on Saturday! We compete in one of the toughest leagues in the state for all sports and swimming especially as each many of the top finishers in each event at the league meet will be swimming in the state meet. Girls, a special shout-out, in that in the latest season rankings you were 17th in championship format (scoring 4 swimmers per event) and 27th in dual meet format (scoring 2 swimmers per event) out of the 310 schools/teams in the state with swimming. 1.) Swimmers will be split this week into attending one of two meets. Swimmers attending Strongsville Invitational on Wednesday 1/9, your bus will be 4:45pm and the meet will start at 7:00pm. Anyone in the meet on Wednesday should NOT report to practice, just to the bus at the HS at 4:45pm. The meet is at Strongsville Rec Center, NOT Strongsville HS. 2.) Swimmers attending Perry Invitational on Saturday 1/12 will be in sessions by a girls meet in the late morning and a boys meet in the afternoon. Girls bus will leave at 8:00am and the meet will begin at 11:00am. Boys bus is TBA and boys start time is TBA. I am sorry I cannot give you more information but we simply do not have it until Perry combines the entries and gives a timeline. I would estimate, please understand this is without knowing the exact number of teams and entries, a 2:00ish bus time and a start of maybe 3:00-4:00pm? As soon as I receive information on the timeline I will send an update email. When the girls meet ends, boys warmups will begin 20 minutes after. We will have 2 different busses, one for girls and one for the boys. So girls you will travel out, then return after your meet. Boys you can sleep in, then travel out and return after your meet. Wed 1/9 PM – JV Meet at Strongsville Rec Center. Bus 4:45pm. Start 7:00pm. Fri 1/11 PM – Swim practice at LH Wellness 2:45-5:00pm. Sat 1/12 AM – Girls varsity meet at Perry. Bus 8:00am. Start 11:00am.